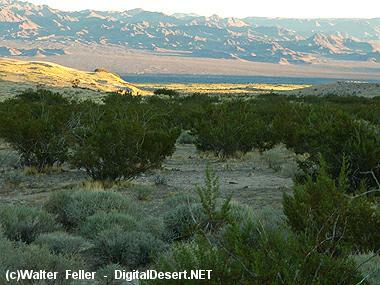 Strong-scented creosote bush and bursage dominate much of the Mojave. Low-lying expanses are covered by these widely spaced shrubs. 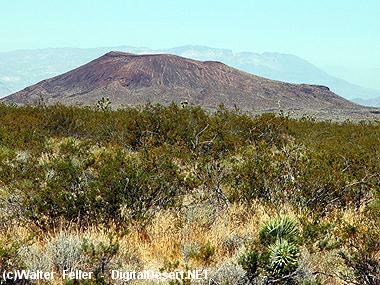 Creosote bushes are said to be some of the world's oldest living things; some colonies in the Mojave Desert are 11,500 years old. Other plants in this zone include desert mallow, brittlebush, and hedgehog cactus. There are several types of cholla, diamond (pencil), silver and teddy bear to name a few. Roadrunners nest in this type of scrub. You may spot one as it darts between areas of cover at up to 15 miles per hour. They can fly but seem to prefer running. 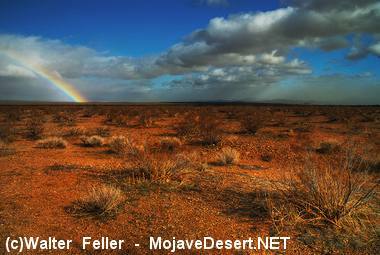 This is the home of the desert tortoise, which uses sharp claws to dig burrows in the sandy soil. Designated an endangered species, desert tortoises and their habitat are protected by federal law. Watch for them early in the morning and after rain storms, especially in spring and summer. Observe them from a distance, but don't bother or touch them. Tortoises are susceptable to diseases that can be transmitted through human contact.